Good things can come from very different sources. 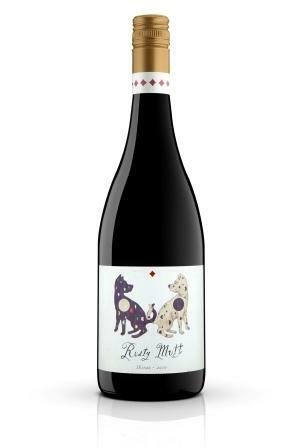 A couple of weeks ago I got an email from Scott who was contacting me about a wine label called Rust Mutt. I had not heard about the label previously but when I found out that the wines were made at Adam Hooper’s small facility (Adam makes La Curio wines) it sparked my interest even more. After a phone call outlining that at this time Rusty Mutt has a 2010 Shiraz and a Viognier was to be released soon – I organised a sample of the Shiraz. So here is what I understand about Rusty Mutt. Scott is the winemaker and they source Shiraz from 2 different McLaren Vale vineyards and are handpicked before entering the wine facility on Foggo Road. Destemmed (not crushed) into 2 tonne open fermenters and the use of specially selected yeasts. Hand plunging, basket pressing and no filtering means the wine is handled the least number of times in as gentle way as possible. The next stage is interesting – only 4-5 year old oak is used for the 18 month maturation. Why is this interesting? Well most oak used for McLaren Vale Shiraz would be new to 3 years old and so oak here is definitely a supporting act. Straight away the wonderful Shiraz fruit comes shining through. The aromas of plums and cherries with hints of red licorice and an almost perfume character. the drinking is where the fruit treatment hits you. This wine is elegant and silky smooth – one could almost call it a feminine wine. There is nose of the in your face gutsy McLaren Vale Shiraz. Instead there is a complex fruit compote with black and blue fruits with hints of red and black licorice and even a little chocolate action. Little oak influence – particularly when the wine has been given time to breathe. The complexity lends itself to food but more subtle styles like a roast duck curry – in itself different as I do not believe I have previously recommended a McLaren vale Shiraz to be consumed with duck. This entry was posted	on Saturday, August 17th, 2013 at 5:05 pm	and is filed under McLaren Vale, Wine. You can follow any responses to this entry through the RSS 2.0 feed. You can leave a response, or trackback from your own site.